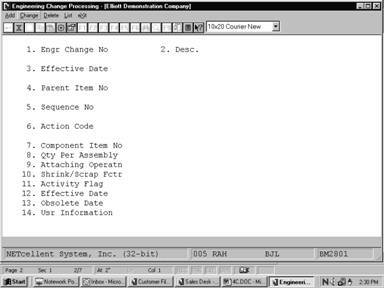 The Engineering Change Processing application allows the user to make modifications to a product structure without immediately implementing those changes in the production process. Modifications are stored in a separate file until the Post Engineering Changes application is run. At that time, the user may specify which changes are to be made to the Product Structure File. Before they are posted, engineering changes may be changed, deleted, and/or printed on the Engineering Change Edit List. 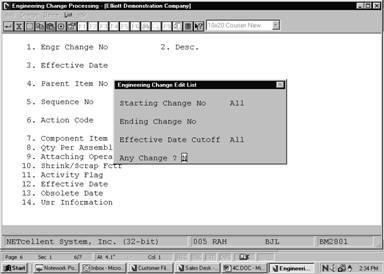 After posting, engineering changes may be printed using the Engineering Change History Report application. When making an engineering change, the user will be prompted to enter the parent item number of the product structure to be modified. 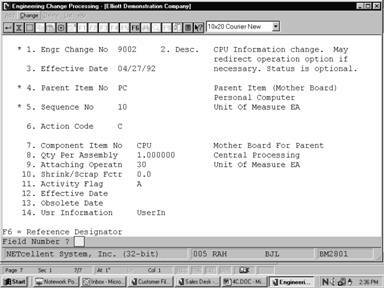 This is followed by a brief description of what the change involves or any other relevant information that the user wants to be printed on the edit list and Engineering Change History report. The user will then be prompted to enter a sequence number. Components will display and print according to this sequence number. If the sequence number entered already exists in the product structure, the user may choose to either change or delete it. If the sequence number is new, it must be added to the product structure before it can be modified. The user may then enter specific information related to the component item. For more information on product structures, consult the Product Structure File Maintenance application section of this manual. * Select the desired mode from the Engineering Change Processing menu bar. To return to the menu bar, press the ESC key. To leave this application, press X for EXIT when positioned at the menu bar. Enter the engineering change number. In add mode, press the F1 key to bring up the next engineering change number on file. 3 lines of 30 alphanumeric characters each. Enter a description of the engineering change. This description will be printed on the Engineering Change Edit List and the Engineering Change History Report. A blank description is not allowed. Enter the date on which the engineering change should become effective. Note: Engineering changes do not affect product structures until posted in the Post Engineering Changes application. Default is the current date. Enter the parent item number whose component will be affected by the engineering change. In add mode, press the F7 key to search by item number or press the F8 key to search by item description. Enter the sequence number, which will be used with the parent item number in this product structure record. The sequence number may not be zero and a parent may not have records with the same sequence number. In add mode, press the F1 key to search for the next available sequence number in the product structure. Press the F7 key to search existing components. In change mode, press the F1 key to search for sequence numbers already on file for this engineering change. Press the F7 key to search for existing components, or the F8 key to search for engineering changes. If the sequence number already exists in the product structure, it may only be changed or deleted. If the sequence number is new to the product structure, it may only be added. Enter the item number of the component to be linked to the sequence number. If the sequence number already exists in the product structure, the item number and description will display automatically. The user may change the item or leave it alone. Press the F7 key to search for an item by number, or press the F8 key to search for an item by description. 10 numeric digits with 6 decimal places and an optional minus sign (9999.999999-). Enter the quantity per assembly for this product structure record. This is the number of component items needed to make one parent. Entry is not required. Enter the number of the operation in this parent's routing where this component is to be used or attached. 4 numeric digits including 1 decimal place (999.9). Enter the percentage of the component which is anticipated to be lost due to scrap, shrinkage, etc. An active item is one currently in use or being sold to customers. A forecasted item is one, which is forecasted to be active in the near future. An obsolete item is one which is no longer a standard part, though there may still be a supply of the item on hand which can be sold or used in other manufacturing processes. Enter the effectivity date for this component. If the item has no effectivity date, this field may be left blank. If the item is forecasted, this is the date the item should become active. Enter the obsolete date for this component. If the item has no obsolete date, this field may be left blank. If the item is active, this is the date the item should become obsolete. The name for this field may be defined by the user in the BOMP Setup application. The field can be used for any purpose the user desires. This field is not displayed if the user-defined field in BOMP Setup is blank. 3 lines of 60 alphanumeric characters each. This field can be used to show a routing of a component item. It will be printed on work orders and may be printed on several reports. Enter the starting engineering change number for the range of engineering changes to be printed. Defaults to All. Enter the ending engineer change number for the range of engineering changes to be printed. Defaults to the starting engineering change number. Enter the cutoff date for the range of engineering changes to be printed. Only engineering changes with effective dates on or before the date entered will be printed. Defaults to All. needed. Inspection operation may need additional queue.